Hey, friends. 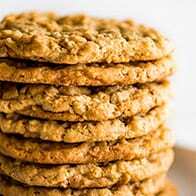 I’ve talked before about how while I fully love every recipe I post here, there are some I get extra excited about sharing with you. My Tri-tip recipe was one, these Country-style Ribs and Carnitas were too. And today, I have another one for you: Carne Asada. I can’t wait for you to try this recipe, because it is the best homemade carne asada you will ever eat. You get super flavorful tangy meat, and since you’re going to cook it over fast, high heat, it’s also got those crispy, charred edges that, as the chef, you totally have first dibs on. 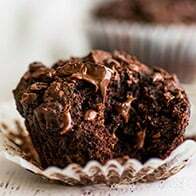 For the full, printable recipe, scroll on down to the recipe card. 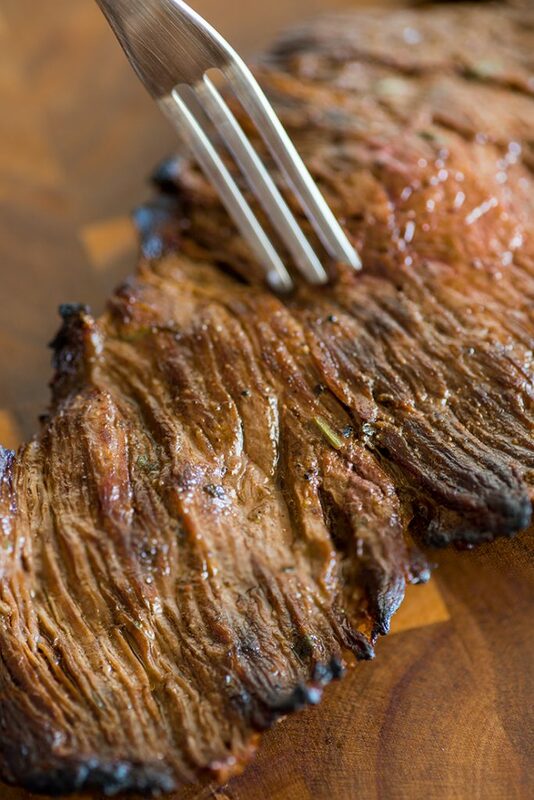 If you’ve never made carne asada before or have some carne asada questions, read on. 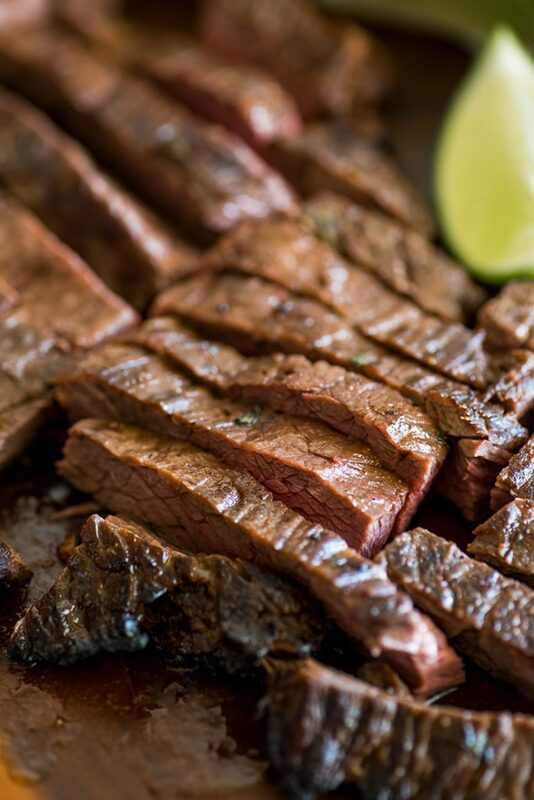 Carne asada translates literally as “grilled meat.” It’s preparation varies, but generally, it’s thin cuts of beef sometimes marinated, sometimes prepared with a rub, and grilled or cooked over high heat. 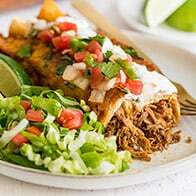 It can be served as a stand-alone main dish or sliced and used as filling for tacos, burritos, and other dishes. What kind of meat is carne asada? There are a few different cuts of beef you can use for carne asada. Most popular here in the US are flank steak, skirt steak, and flap meat (if you’re curious where they all come from, this is a great breakdown). All three are thin-ish cuts with an easily detectible grain that do well when marinated and cooked over high heat. Here in California, I don’t see any one of these consistently available at a reasonable price, so I’ll use them interchangeably depending on price and availability. They’re all going to taste great and get the job done. Given a choice though, my favorite is flap meat. It has a great beefy flavor, is usually the cheapest option, and seems to come out slightly more tender than the other two. While some carne asada is prepared with just a spice rub, this recipe uses a citrus-based marinade. The acids help break down the muscle fibers and tenderize the meat, and it penetrates really well, so the meat picks up a ton of flavor. 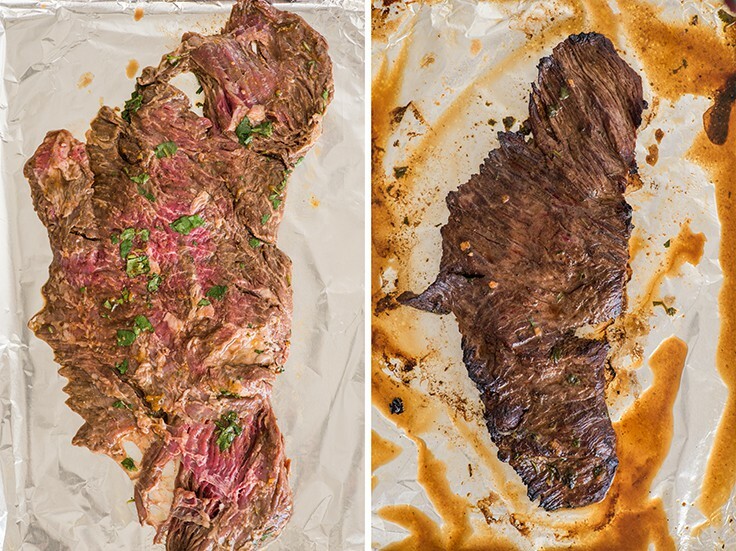 How long to marinate carne asada? If you’re in a hurry, you can get away with just a few hours, but you’ll get the best results with a longer marinade. 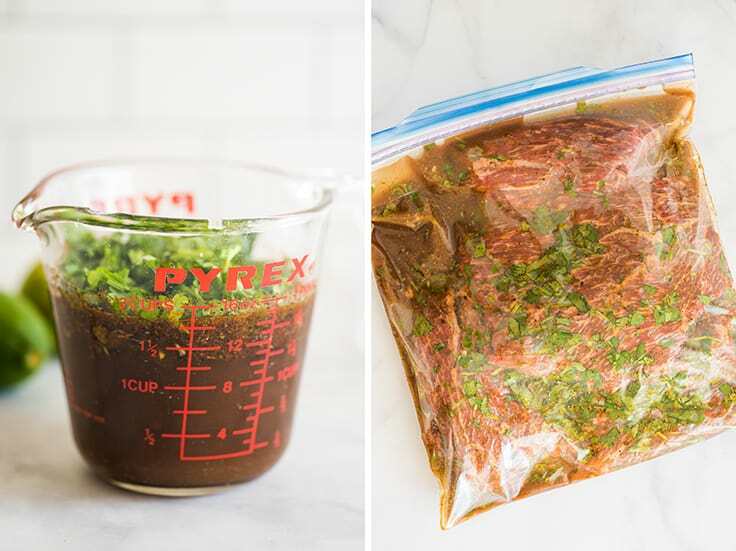 If you can, start marinating your beef the night before. You won’t be sorry. Pro tip: I know marinades with more than a couple of ingredients are a pain to make, but this one’s worth it, I promise! Line up your ingredients before hand, in the order they’re written in the recipe, and if you use a liquid measuring cup like the one in the photo above, you don’t actually have to get any other measuring cups dirty. Plus most of the spices call for 1 teaspoon so things will move quickly. Your carne asada will shrink quite a bit as it cooks! Once your meat is marinated, you’re going to want to cook it over quick, high heat. On the grill – Medium-high heat 4 to 8 minutes per side. In the oven – Under the broiler on high 4 to 6 minutes per side. On the stove – Medium-high heat 4 to 8 minutes per side. The meat in the photos was cooked under the broiler to about 137°F at the thickest point. Then slice the meat across the grain. 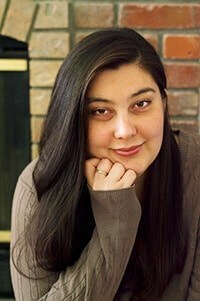 (Here’s why, if you’re curious.) Depending on the type of steak you used, this grain might run all the way down the length of the meat or across it like it does with this flap meat. Fortunately, the grain in all three cuts is pretty obvious, so you shouldn’t have any trouble finding the direction. 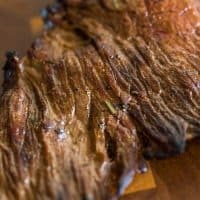 How to serve carne asada? Carne asada can be served as a main on its own with a side of beans and rice. It’s also great chopped and used in steak fajitas, tacos, salads, or burrito bowls. For other carne asada sides, a quick corn salad or easy oven-roasted broccoli are a good option. 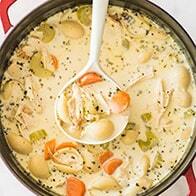 If making under the broiler, save any pan juices to pour over leftovers during storage to help keep the meat moist. This recipe calls for 1 1/2 to 2 pounds of meat, which will serve 4 to 6 people when served as a main dish, but the marinade can be stretched to cover a little over 3 pounds of meat, or whatever will comfortably fit in a gallon bag. You might also enjoy Carnitas Tacos, Chipotle Chicken Tacos, and Basil and Garlic Steak Marinade. This easy Carne Asada recipe will make the best homemade carne asada you've ever eaten. Recipe includes oven, stovetop and grill instructions. Combine and stir together all marinade ingredients. Transfer meat into a large plastic bag or container and pour marinade over the top. Marinate for at least 4 hours, up to about 24, flipping the meat once halfway through. Adjust top rack to about 4 inches below the broiler. Heat broiler on high. Place meat on a foil-lined heavy-duty baking sheet or broiling pan and broil 4 to 6 minutes per side. Pull at 135°F for medium-rare, 145°F for medium. Turn on your kitchen fan and crack open a window. Heat a large skillet over medium-high heat and grease pan with a drizzle of vegetable oil. Cut meat into pan-size pieces and cook in batches, 4 to 8 minutes per side until done or the internal temperature reads 135°F for medium-rare, 145°F for medium. If the outside of your meat begins to cook too quickly or things start getting too smokey, turn heat down to medium. Heat grill to medium-high heat and cook for 4 to 8 minutes per side, until the internal temperature reaches 135°F for mediu-rare, 145°F for medium. 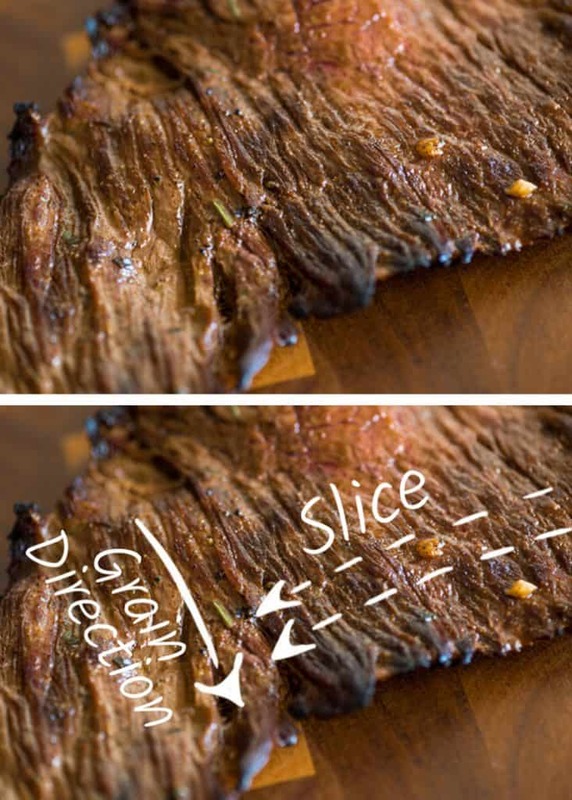 Approximate nutritional information is for 2 pounds of skirt steak divided into 6 servings and assumes 10% marinade retention.